Are you listening? Of course you are. He’s Alec Baldwin, even if he’s saying decidedly un-Alec Baldwin-like things (this, after all, is a far cry from his impersonation of President Trump on “Saturday Night Live,” an orange, ferret-like tuft fused to his scalp). Maybe that’s why you’re listening, but more than likely not. It’s almost involuntary, like a muscle cramp of the mind: When a famous face appears onscreen, we watch. That’s the first layer of Candice Breitz’s arresting seven-channel video piece “Love Story,” which will wrap its long run at the Boston Museum of Fine Arts in late January. 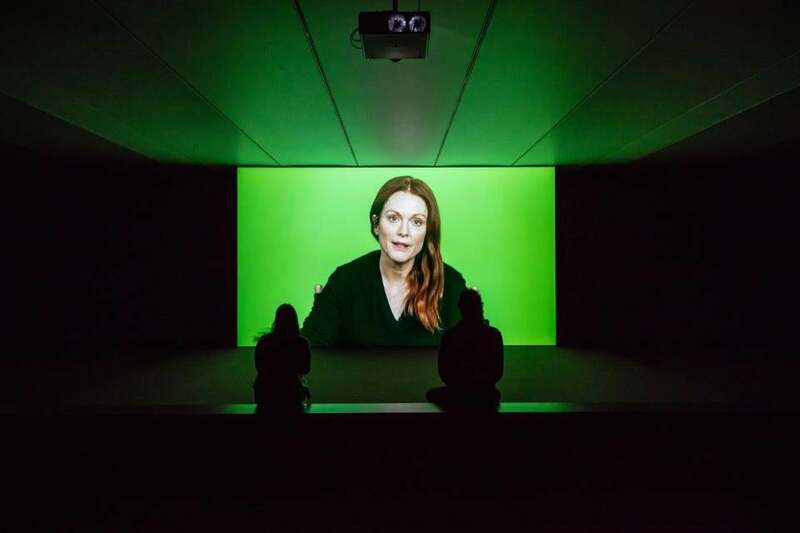 Breitz, a South African artist whose work has always engaged the uncomfortable disconnect between mass entertainment and its legions of consumers, enlisted Baldwin and Julianne Moore for the piece. Their job was simple: to serve as the vehicles by which the stories of six refugees from all parts of the world would travel here, to a darkened museum gallery, where, when you see them, you stop. Because of course you do, because that’s what the famous do to us. If that were all there was to “Love Story,” it would be a cynical gesture indeed — a harsh scold for a society so stunted as to need star power to unlock an emotional response. This is pop-culture terrain Breitz has traveled before: In her 2008 piece “Him and Her,” a video catalog of performances by Jack Nicholson and Meryl Streep embodied a range of emotion so expertly and complete you’re left deeply aware of your own empathic shortcomings. In another work, Breitz lip-syncs scenes of particular pique from Reese Witherspoon and Meg Ryan, to notably flat effect. She called it “Becoming,” the futility being the point. We name them all, of course, because to do otherwise would be simply to prove Breitz’s point: That a tragic tale expertly performed does more than amplify it: It makes it better. Expertly edited and interwoven by Breitz into a tight, affecting script that toggles back and forth onscreen between Moore and Baldwin as they inhabit all six, “Love Story” surely gives us an interface that invites without repelling. The actors’ familiarity is a comforting buffer that both leavens the terror and gives us permission. Their job is to be watched, and so we do. Importantly, they’re not alone here. In an adjacent space, not visible from what’s clearly the main event, all six subjects are given their own screen, where you can watch each of their hours-long interviews in full. The effect is a Cyrano de Bergerac of media arts, and empowers Breitz’s implicit critique of our media-honed attention: Reality lacks production value, and the medium really is the message. Let us take nothing away from the actors: I don’t know that you’ll ever see Baldwin more understated, plainspoken, and affecting, or Moore more direct and emotive, stripped bare of artifice. The best word I can think of to describe their performances is deferential, and this is where things begin to coalesce. Breitz includes what appear to be outtakes with her famous stand-ins in which questions are asked to be repeated, laughs are stifled and released. Whether they’re genuine actorly flubs or performative snippets of the refugees’ own stumbles, I can’t tell, but they function as a gesture of connection between the two that should not go unnoticed. They more deeply unite Moore and Baldwin with their subjects, while at the same time heightening their divisions (for the actors, it’s work; for their subjects, it’s life). But why “Love Story”? It’s a play on a standard Hollywood trope, says the artist, and a reference to the refugees’ own desire to transcend their circumstances. Breitz has chosen six subjects to represent a breadth of refugees and the array of persecution they might face, but as an effort to humanize faceless hordes of migrants (thousands of whom are crowding our southern border right now), it still seems an economy of convenience. But that’s a small complaint. Breitz, keenly aware of the celebrity veil, lifts it with a deliberate grace. “Mr. Alec: You must be happy . 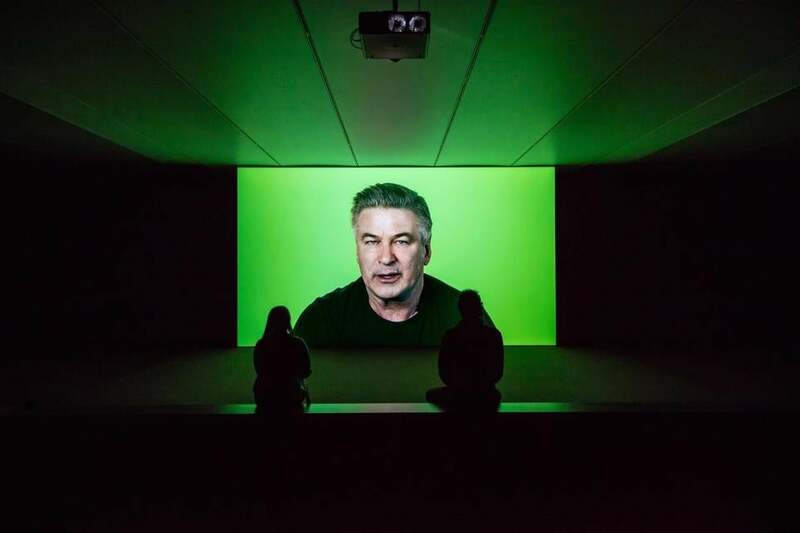 . . that Candice is giving you this opportunity to give people my story, to tell them about my life,” Baldwin says, sternly, embodying whom, exactly, we’re not quite sure, though he surely speaks for all. “I know that when she will listen to the story and share it with the world it won’t be the same as if it were just me coming to stand here, just me sharing my story, because I don’t think all those nice people would come just to listen to my story,” Moore says, in a voice that could be anyone’s but hers. This, after all, is the point. We’re here listening, Julianne, because it’s you, not her. The alternative, to not listen at all, is both the easy choice, and the one we can’t abide. Love Story, 2016 [TRAILER] from Candice Breitz on Vimeo.